Our Favorite Garage Door Opener - The Wright Door Co.
We are proud to offer and install LiftMaster’s garage door openers. We especially love the LiftMaster 8550W – so much so that we wanted to tell you a little more about it! Read on for details about this powerful, dependable garage door opener. 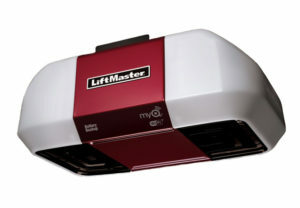 Why Do I Want to Choose the LiftMaster 8550W Opener? Smooth, powerful, and reliable – The 8550W opens and closes the door smoothly, without the noise and creaking. It’s made from quality components and backed by a warranty. A great value – This is a fantastic, high-quality product for the price, especially with the current sale! Long-lasting – Built to last a lifetime with proper care and maintenance. Please click here if you have never looked into annual maintenance for your garage! Just like your other home appliances and structures, to run smoothly and save money on repairs, you need to take care of it with annual maintenance. Tech capabilities – The LiftMaster 8550W has Wi-Fi capabilities and can operate with your phone, tablet, or desktop. Why is this helpful? You can operate your garage door online 24/7, even if you are away from home or already in the house for the night. You can also get push notifications (alerts) when the door is open to make sure no one is trying to access your garage when you’re away. Be sure to read our info about the Surge Protector, as it is CRUCIAL you purchase and use one with your new opener, as the warranty does not cover all the computer components in case of a power surge! Energy efficient – Save money and energy every time you open and close your garage door.